Philosophy has so many amazing sets for the holidays, that I honestly do not know where to begin. I am going to run down all of the Holiday items, but limit the images to my very favorites, just to make the experience easier on all of us. Let's just say everything is magical, and done in only the finest ways that Philosophy can do. body soufflé 2 oz. ; and lip shine .5 oz. 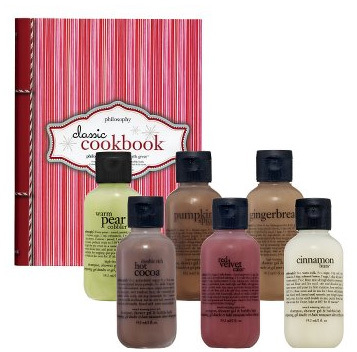 6 recipe-inspired shampoo, shower gel & bubble baths 2 oz. shampoo, shower gel & bubble bath 16 oz. marshmallow flavored lip shine .5 oz. shower gel & bubble bath 16 oz. snow shower exfoliating gel 4 oz., snow body lotion 2 oz. pure snow flavored lip shine .5 oz. pink frosted lip shine .5 oz. ; pink frosted body lotion 8 oz. flavored lip shine .5 oz. & bubble bath 16 oz. shower gel and bubble bath 16 oz. foaming bubble bath and shower gel 16 oz. holiday spice scented shampoo, shower gel & bubble bath 8 oz. To see all of the images and to order, visit Philosophy.com, Nordstrom.com or Sephora.com.